We held our first test of the year on Sunday 23rd March on a dry but cold day. 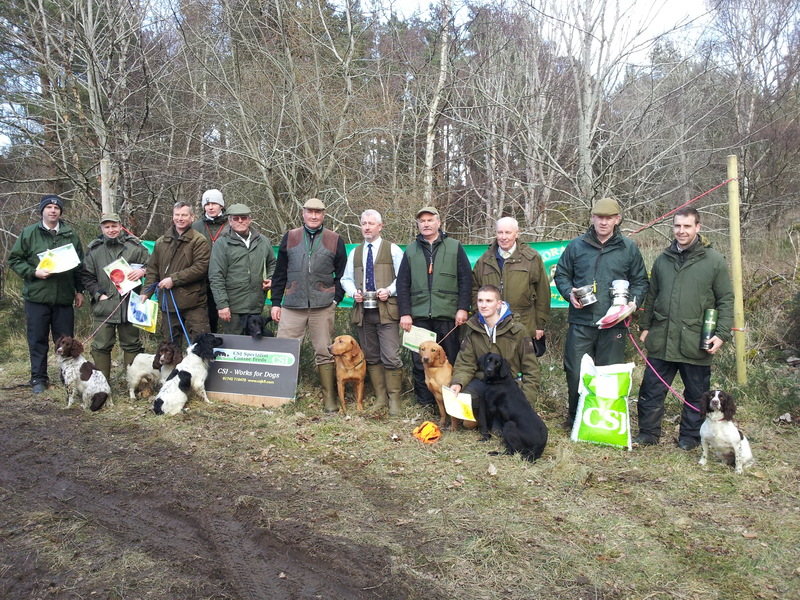 To be honest I was staggered by an entry of near 100 spaniels and retrievers which was an excellent start to our year. “It’s the last race of the SDAS season and another great win for Danny Fitzgerald and his sled dogs at Bowland trails in Perth. He and the dogs managed first place in the 4 dog class making him the SDAS 4 dog champion. He was second in the bike class which made him second in the championship, beaten by our dog’s brother!! It was a fantastic race with 3 stages which meant running Saturday morning and evening and Sunday morning, dogs needed to be at peak fitness and can get very tired but Danny’s team managed to be consistent with their times thanks to their training, nutrition and hydration. 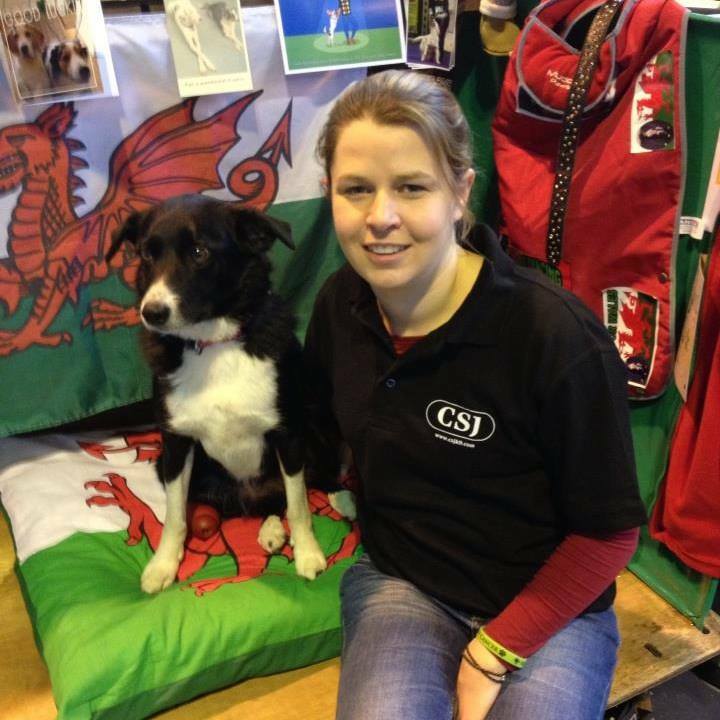 On Saturday 15th March 2014, not to clash with any other events, I decided to go with the selection of a dog to represent Wales as part of Team GB at the Kennel Club International at Chatsworth on May 29th and 30th, 2014. As a consensus from handlers, and requiring a ground mirroring the conditions at Chatsworth, I decided to hold the selection on Mooreland near the Dulais Top near Merthyr. I’m indebted to Wesley Thomas for allowing us to use this fantastic, testing ground. Due to certain pressures this season I brought Roger Phillips in to assist with the selection and the running of the day, and I would like to thank him for all his hard work. The judge was Jayne Coley, a lady who needs no introduction having won the open working test and judged the International at Chatsworth the year before; who better to assess our top dogs for what they were to be put through. I would like to thank Jayne for her contribution, fairness and leniency during the selection test, as some handlers had travelled from as far away as Anglesey. Why not a Welsh A Panel judge you may ask? – as some have commented – Out of six A panel judges, Roger had given his commitment to assist, I made it clear that I wanted to compete, two others had made apologies as they had business commitments, one was to judge the International, so I felt looking for just one dog, relating to Team GB, not a Welsh Team, that Jayne was the ideal candidate to assess the dogs at the selection day. A criterion was set for entry, a dog must have at least won a Novice Trial or an Open Working Test, and hence over 20 calls were made to invite the pool, of which eleven dogs started. The first stage was a static test with a mark over a wall and a short blind, both in rush; this caused the majority of dogs a problem. We then proceeded to a drive, after the drive three retrieves were to be collected, a blind across the lake, a blind out along a track and a very long mark. The water proved to be the end for three dogs, all failing to enter water. 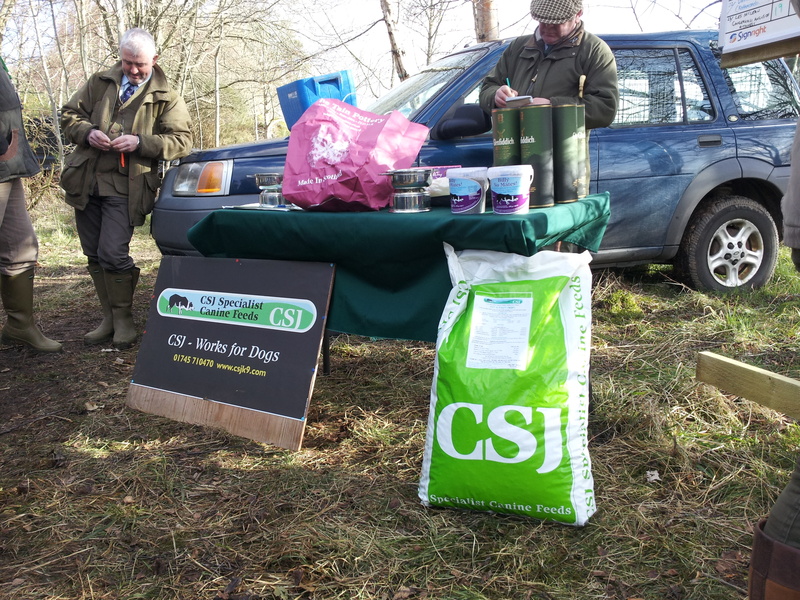 The mark proved too difficult for two dogs but the blind was achieved well by the majority. Hence we arrived at a late lunch with only four dogs going forward to the walk up exercises in the afternoon. At this stage Craig Perry and Alan Rees were within a couple of points of each other with Nigel Probert some points adrift and with Annie Wales just behind Nigel, all to play for. The walk up was in four phases a mark, then a blind, a double element with a blind and marked diversion and then a long blind with no shot, all designed to simulate a shooting day. The come back then started, Nigel Probert achieving a maximum 100% on these tests. I had not seen anything like this since watching Billy Steel Senior years ago gaining a 100% at the Game Fair, well done Nigel. The end result was a tie for first place between Nigel Probert and Craig Perry then 3 points adrift Alan Rees, and then came Annie Wales, credit to all four dogs. As this was a selection day Nigel Probert was the dog selected to represent Wales at Team GB, his six maximum scores of 20 out of a possible 20 was enough to tip the balance for me. Craig achieved two maximums, Alan with four and Annie with two. At this level of competition there isn’t a lot to separate dogs and handlers; these were four beautiful dogs on show. 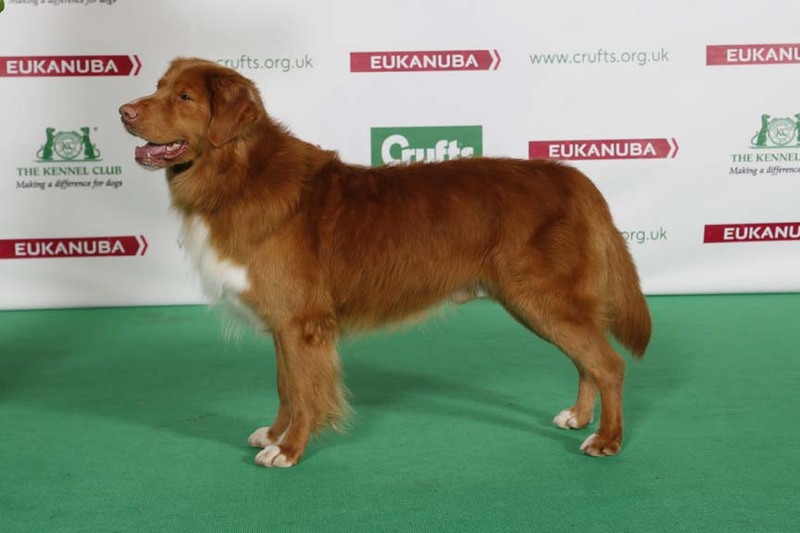 Danehaven Detroit (known as Kenzie) made breed history in 2010 by becoming the first Nova Scotia Duck Tolling retriever to be awarded Best of Breed that was bred and owned by the exhibitor. 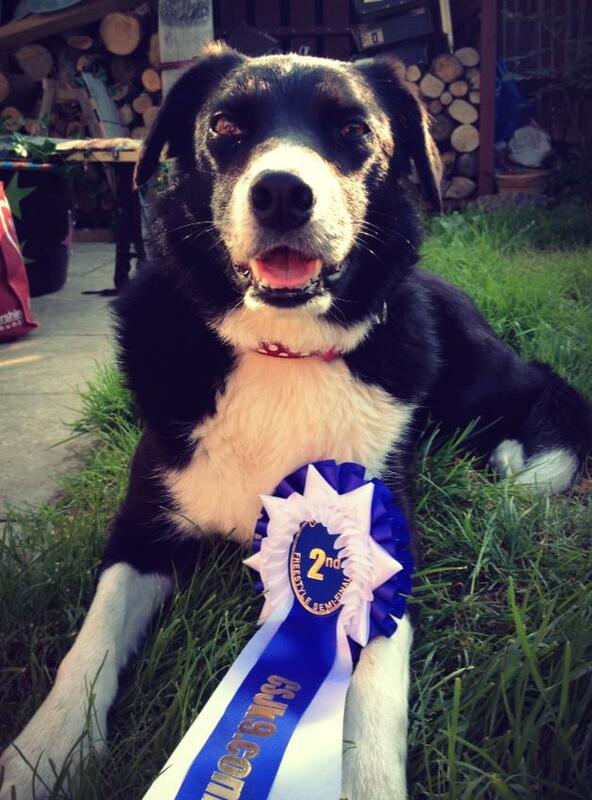 He has now done it again in 2014, being only the second dog to win Best of Breed twice. He is 7.5 years old and was originally donated to hearing dogs for the deaf at 8 weeks old but was returned at 8 months as he did not complete the training. 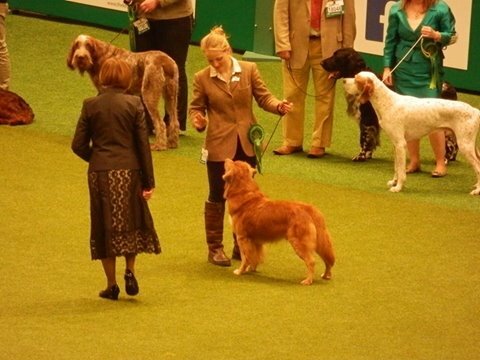 He then went on to have a successful showing career, winning seven Best of Breeds at Championship shows and several at Open Shows,before CC's were awarded to the breeds. 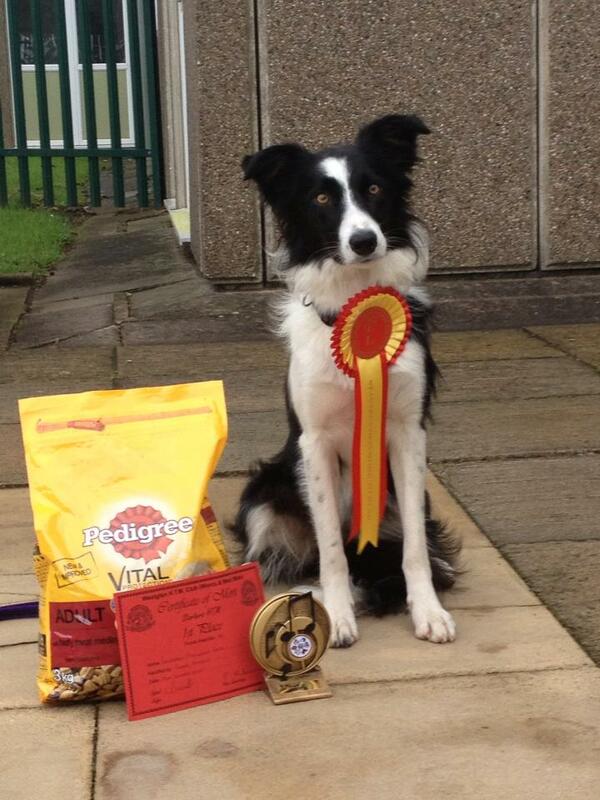 After CC's were awarded in March 2013 Kenzie has numerous reserve Best of Breed successes and now his Crufts' win. Kenzie has sired several litters and some of his progeny have gone on to successful show and working careers. 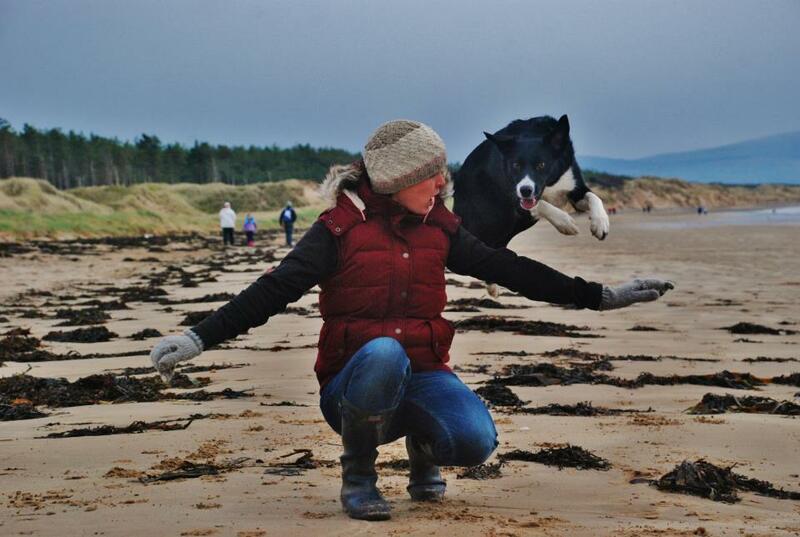 Eira and I represented Wales at Crufts in the International Freestyle competition. 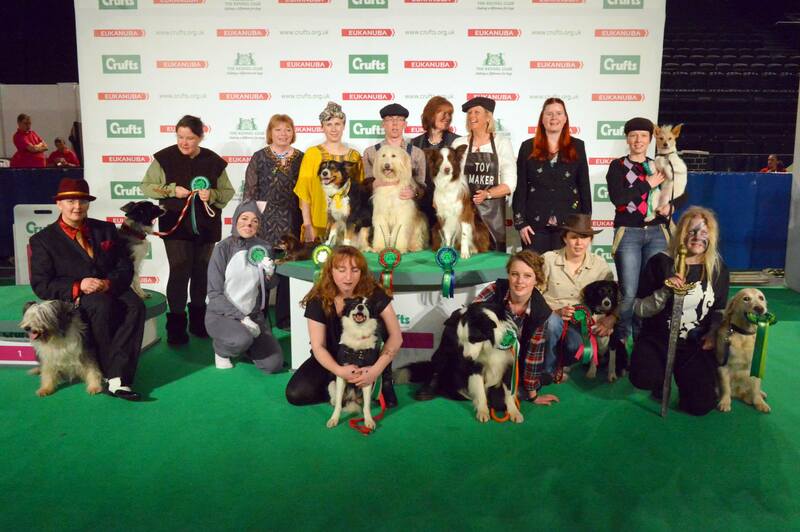 Performing at Crufts in front of a packed main arena crowd of 6000 people was the most amazing experience ever. People ask me if I was nervous, but quite honestly I was just totally buzzing! It was an early start to my Crufts day, arriving at 7am to give me chance to take Eira in to the main arena and for us both to get an idea of how big it was and all the things that might put us off. I was mainly thinking that the big armed camera might take some getting used to but Eira was more interested in the marks on the floor (to mark the position of the agility equipment), She had to make sure they were not edible before she agreed to give her attention to me. At 11.00 we were briefed and from then it moved very quickly. The event on in the arena before us was agility and the collecting ring had a jump in it for competitors to warm up. Eira loves agility and this didn’t help her excitement – I think she was a bit disappointed not to walk out to a full agility course! ther than trying to make her work. went so quickly, every time I perform this piece I struggle to believe it is 4 minutes long because it feels like 2! I couldn’t have asked more from Eira. The adrenaline meant that she was even more excited than normal and that the timing and clarity of my commands wasn’t top notch either! Leading up to the competition, she had been a bit sticky on a couple of moves, I had been practicing these moves at home and my partner said he was holding his breath in the crowd when I did them, but she was perfect. Talking about training, I’m always asked by people ‘do I train a lot?’ I very rarely train a whole routine, I just do 5 minutes here and 5 minutes there, working on a particular move. With Eira, once she has learnt a move it’s easy to incorporate putting it in to a routine. 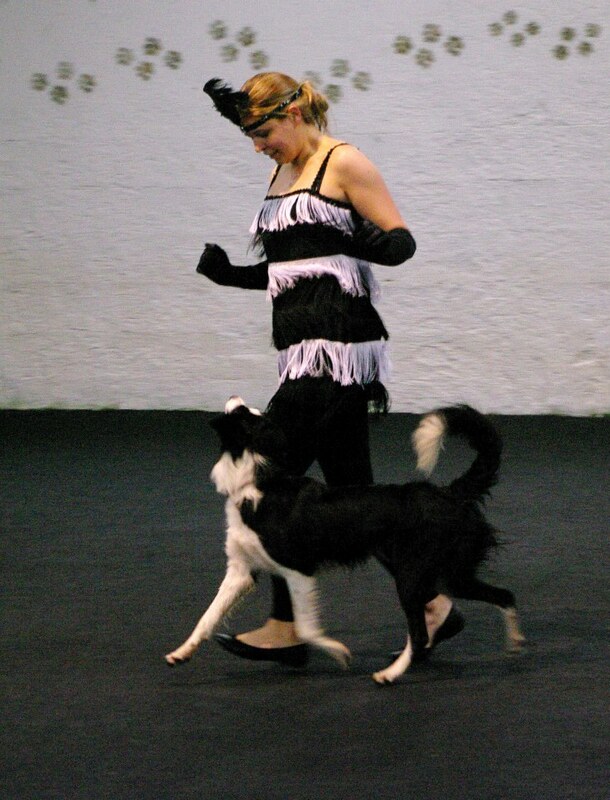 The hardest bit is coming up with the ideas, music and choreography – that takes me a lot more time than training the dog to actually do it! My scores were amazing! Unfortunately as expected Eira barked and not just a bit – I have an ongoing issue with barking and it is sometimes worse than others. This time, she barked the WHOLE way through. The atmosphere just sent her off the scale – she must get her gobbiness from me! The barking meant that I got some pretty hefty deductions as there is a rule that says they shouldn’t bark. My final placing was 9th out of 10. I would have been 5th without the barking deductions but to be honest I didn’t care where I came, the standard was phenomenal. We were up against World and European champions! I was just so pleased we put on a good performance and that Eira was happy and really showed what she could do. I had an overwhelming amount of support and nice comments about our performance which was just wonderful and made the experience even more brilliant. I am one very lucky girl! The Ely & District Wildfowler’s popular charity gundog tests will be held on Sunday 11th May 2014 at Frank’s Farm, near March, Cambridgeshire, by kind permission of Mr. Michael Deptford. 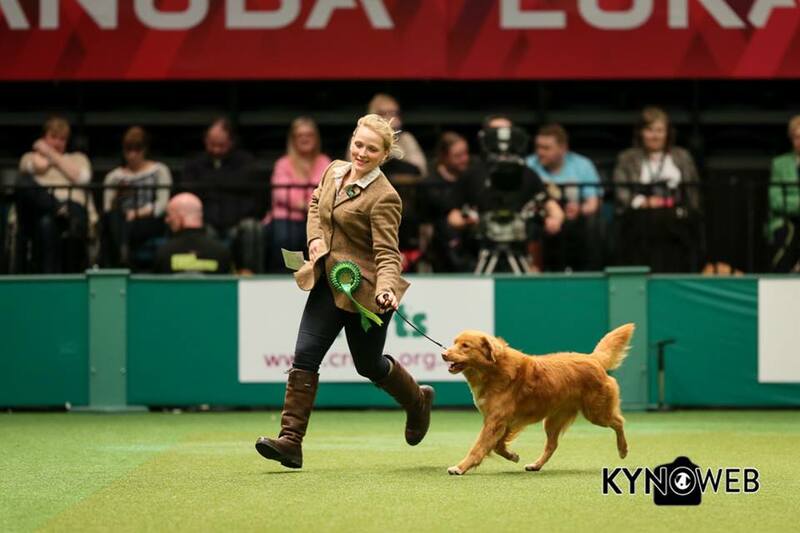 The test’s comprise of an Open and Novice run off the same stands, albeit that much more difficult for the Open dogs. BASC are sponsoring the Open, while Ely & District sponsor the Ken Gandy novice trophies. 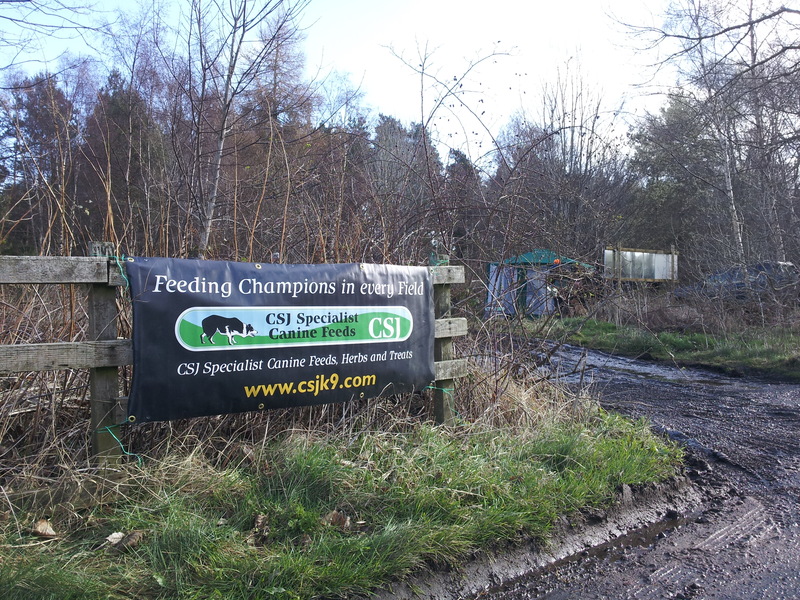 CSJ Specialist Canine Feeds will sponsor all places in both events. The “Derek Robinson” Team trophy is also up for grabs, being defended by last year’s winners the Kirkmarsh Flyers Irish Water Spaniel team. 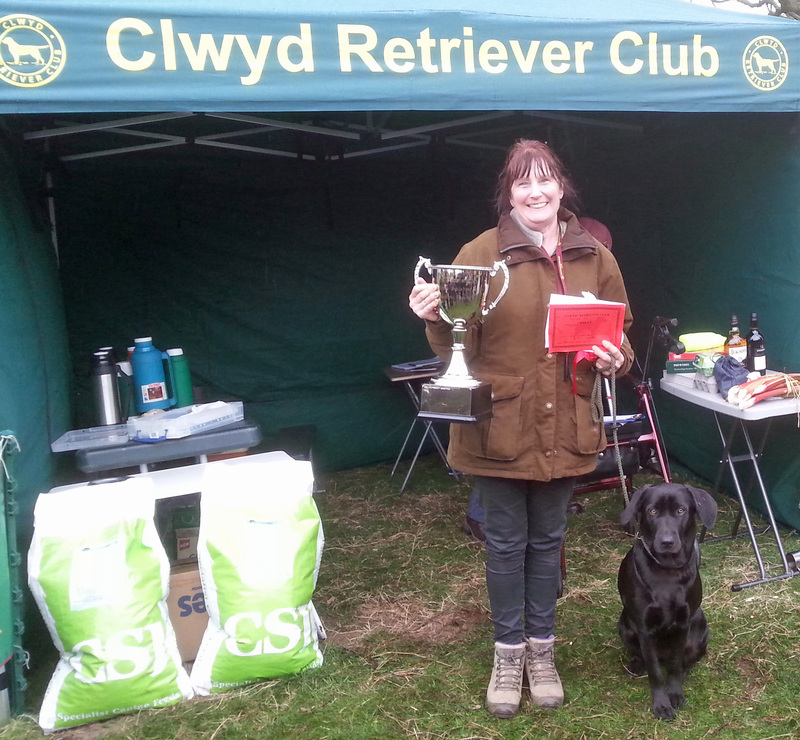 EDWA welcome both single entries and also teams of four dogs from training, breed, wildfowling clubs or shoot syndicates. The advantage of running a team is a slight reduction in price. Teams can be a mixture of both Open and Novice. Each class is automatically entered into their respective class be it Open or Novice. This years judges are Mr. Melvyn Hurst, Mr. Dave Gresty, Miss Katie Capps and Mr. David Wilcox. Monies raised through the sale of light refreshments and from the prize draw to the Breast Cancer Trust Unit, Peterborough Hospital.